That is exactly what happened recently to a Mira Mesa home on Featherhill Lane. The house erupted into flames and took almost 30 minutes for firefighters to control. Two older women, a 69-year-old mother and her 48-year-old daughter, were found by firefighters in an upstairs bathroom. Both women were rushed to the hospital in critical condition and it is our hope that both will pull through. Although the exact cause of the fire is unclear, initial investigation from San Diego homicide detectives believe that the fire was not an accident. If another party purposely started the fire that caused serious burn injuries to these two women, then the at-fault party will be held accountable for all damages. Gas leak from a defective home gas system. Unattended fire or electrical device. It is a very important reminder for everyone that in the event of a house fire, get out of the house as quickly as possible. According to the Federal Emergency Management Agency (FEMA), it only takes two minutes for a fire to become life-threatening and five minutes for a house to potentially be engulfed in flames. 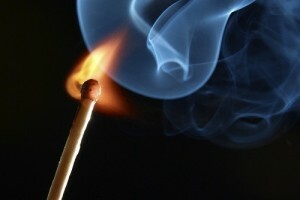 Even if away from the flame, smoke and heat can burn an individual’s lungs and cause fainting-like symptoms. After experiencing a serious burn injury due to the carelessness of someone else, it is important to get legal guidance from a committed Mira Mesa burn injury accident attorney. Let Jurewitz Law Group help get the settlement you deserve by calling (888) 233-5020 for a free case evaluation.